Rusted, damaged gutters can be a real problem for many homes across Brisbane’s Southside. Such gutters are not only unsightly, but also ineffective. This means that your guttering is likely to leak and overflow when it rains. This can cause damage to other parts of your home. Therefore, it is always a good idea to maintain your gutters well. If you think your guttering is reaching the end of its lifetime, then we can help. Here at Strongguard, we know every feature that goes into gutter replacement. We recognise that to offer the best quality gutter replacements, we must combine quality materials with quality workmanship. 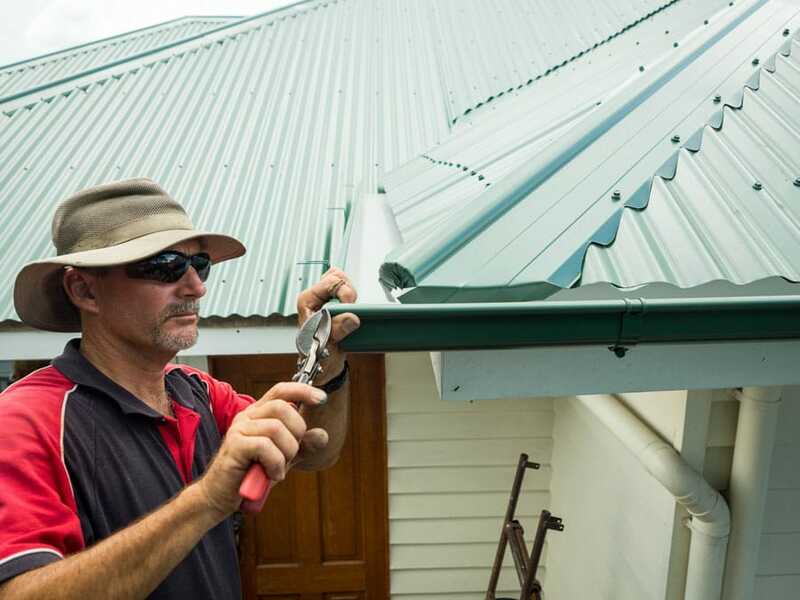 All of our replacements are done with quality COLORBOND® steel gutters. This ensures great looks and durability. When coupled with our targeted approach to installation, these gutters will last you well into the future. On average, most gutters will last no longer than thirty years. Because of this, it is not unusual to have to replace your gutters – especially in older homes. If they are not installed correctly, then they are sure to deteriorate at a relatively fast rate. For this reason, the team here at Strongguard are focused on quality gutter replacements. We have spent over twenty years spent working in the industry. As a result, we know what it takes to deliver durable and hardwearing gutter replacements. The quality of your guttering comes down to two things: installation and materials. When it comes to both, Strongguard has you covered. We source all of our gutters from BlueScope Steel. This means that you are getting pure Australian made quality. These gutters come in a variety of profiles and capacities and are designed to thrive in heavy rainfall. 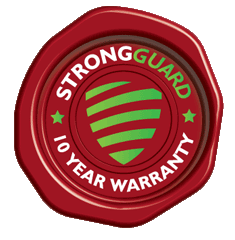 Here at Strongguard we always measure your guttering carefully before we do anything. This ensures that your new gutter is tailored to your roof individually. We have experienced estimators to do this. They will use the measurements they collect to source the right guttering. We will also use it to provide you with an accurate quote. We have to make sure that we can safely work on your gutters, before we begin. There are many strict workplace health and safety regulations surrounding gutter installations. We must ensure that we meet these so that our workers are safe, and we are working in alignment with the law. To do this, we will set up trestles, scaffolding and elevated working platforms as necessary. When these are erected, we will remove your existing gutters. Then, using a stringline and level, we set out the new brackets, with falls to the downpipes. We can do this to suit both coloured spike brackets and internal concealed brackets. We always install new brackets, to ensure the best in quality. When the site has been sufficiently prepared and all old gutters have been removed, we will install the new gutters. These gutters are either COLORBOND® steel and offer unrivalled quality. To carry this quality through, we install them carefully. Each join and corner is top-riveted and undersealed. This creates a great weatherproof seal. It also allows the guttering and joins to expand and contract as temperatures rise and fall. This will prevent cracks and damage. 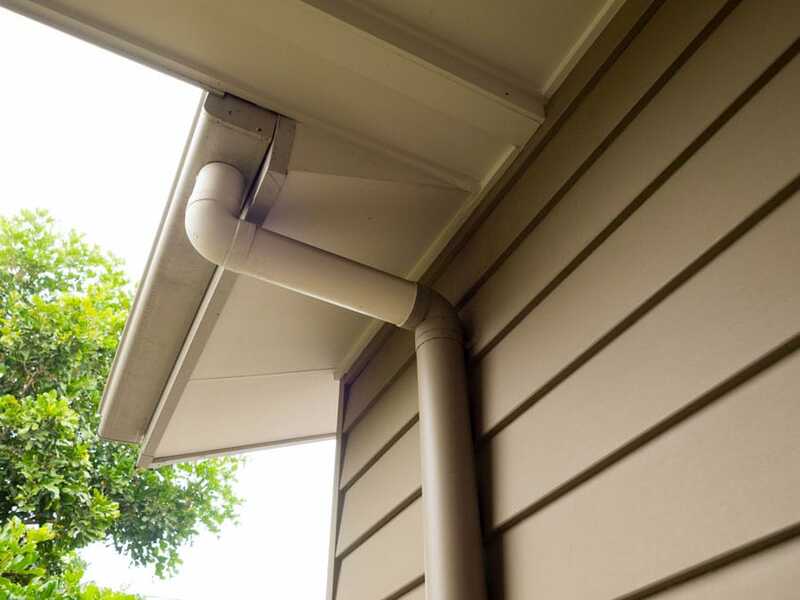 Finally, we will integrate PVC or COLORBOND® steel downpipes into your guttering system. We understand that different homes deal with rainwater differently. For example some homes choose to collect rainwater in rainwater tanks, while others direct rainwater into stormwater drains. For this reason, we can connect your downpipes to rainwater or stormwater systems – the choice is yours. Once this is done, we will remove any scraps and debris, so that your property is left how it was when we arrived. 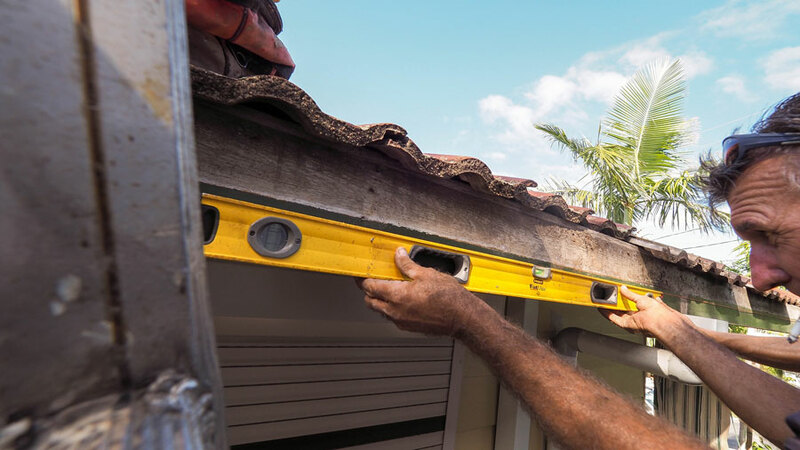 If you are looking for gutter replacements in your home on Brisbane’s Southside, then contact us today. You can reach us over the phone, or you can lodge an online enquiry. Our friendly team will work with you to identify your problem. Once we have done this, we can develop a targeted guttering solution, centred on your needs. #1 My gutter leaks consistently between my house and deck. What can you do to fix it? This is one of the most common guttering issues for homeowners across Brisbane Southside. Usually, this indicates an issue with how your patio attaches to your house. To fix it, we can simply redesign the attachment with new flashings and guttering. With each replacement, you get superior alternatives from COLORBOND® steel. #2 I have a multiple storey house, can you still reach my gutters? We have access to all the equipment necessary to safely replace gutters at any height. Our equipment includes scaffolding, booms and elevated work platforms. This means that accessing your gutters will not be an issue. #3 If my gutters are not working properly, does it mean I need more downpipes? In most cases, overflowing or leaking gutters are a sign of damage or poor installation. This can include rust, or incorrectly falling gutters. This can be fixed by a gutter replacement from Strongguard. If you have an old house however, then there is a chance that you don’t have enough downpipes. Contact us and we will send an estimator to assess your situation. #4 If rust is only affecting one part of my gutter, will you still replace it all? We can replace individual parts of your gutter, but we advise against it. A complete replacement is a higher quality, long term solution that represents better value for money. #5 If my gutters aren’t falling correctly, can you re-fall them? We can re-fall your gutters, although we strongly suggest that you replace them. Re-falling requires almost as much work as a complete replacement. This is normally not worth it if you are keeping your existing gutters. Instead, we recommend a complete replacement with BlueScope steel gutters.